I am not much of a history buff, but heaven knows I am an archivist of popular culture, but I am gradually divesting all that I have archived. I blogged here earlier about donating my large astrological library to the University of Illinois. I sold my astrology company (Matrix Software) to my friends (and competitor) David & Fei Cochrane, and I sold my online company AMG (All-Music Guide, All-Movie Guide, All-Game Guide) years ago. 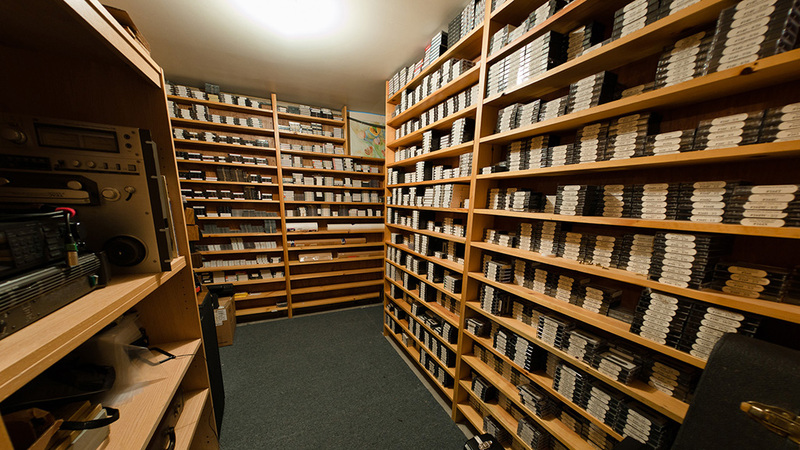 My personal collection of music on CD is now in a warehouse in Ann Arbor, and I am told numbers over 600,000 items. I donated my research and the entire collection of concert rock poster images to the Bentley Library at the University of Michigan, and so on. There is not all that much left. One thing that I still have is a collection of thousands of cassette tapes of dharma teachings by my teacher the Ven. Khenpo Karthar Rinpoche and other Tibetan lamas. I have had this collection for more than twenty years and it has acted as a back-up for the original source collection housed at KTD Monastery in Woodstock, New York. Recently I have checked my inventory against their own and was able to provide a number of original master tapes that (for one reason or another) they have lost or have missing. I also have a large collection of Buddhist teachings done at the various centers connected to KTD, many of them probably the only copy in existence. Some of the centers lacked the equipment to back up their tapes and just sent me the only copies. I have housed all of these precious tapes in an archive at our studio for all these years. They take up an entire room. However, the time has come to move these tapes to a location where they can be digitized or otherwise used. So I have carefully packed these tapes into two groups of 12 large boxes each. These will be driven from Michigan to Woodstock, New York by some kind volunteer who wants to take in the fall foliage and do something meritorious at the same time. If you are a dharma person (are known to me or to one of our centers), have a van (a car will not do), and would like to undertake such a journey, please get in touch with me (Michael@Erlewine.net). Here is how the trip would go. You would come to our center here in Big Rapids, Michigan. We would feed you and put your up. Then we will load the 24 boxes into your van and you would first drive them to Karmé Ling (our retreat center) near Delhi, New York, unload one group of 12 boxes, and then take the other twelve boxes to KTD (Karma Triyana Dharmachakra) in the mountains above Woodstock, where they would provide you food and a place to stay, and receive the other 12 boxes. Then you would return to your home. I will personally contribute $200 toward gas and, if anyone else reading this would like to contribute additional money for gas and expenses, please pitch in and help out. You can write to me. It is obvious that this will take an extreme effort on someone's part, a very special person, for sure. This is very precious cargo. So….. If this sounds like something you might want to do, message or email me please and we can get it done before the cold weather sets in.